Nuts, pits and seeds have a protective enzyme coating and also contain phytic acid, a smart way of mother nature to keep the seeds from sprouting whenever or protect them from being eaten by hungry squirles. This way sprouting only starts once the coating has been soaked off by rain or water in the ground. Enzymes can cause an upset stomach or the feeling of being bloated. The phytic acid can hinder the accumulation of zinc, calcium, iron and magnesium by the body. Soaking is done in in a big bowl, whatever you are soaking should be covered in plenty of clean filtered water. Click HERE for a soaking time chart. Rinse very well, dry on a cotton towel and the soaked foods can be kept in the refrigerator for about 3 days. 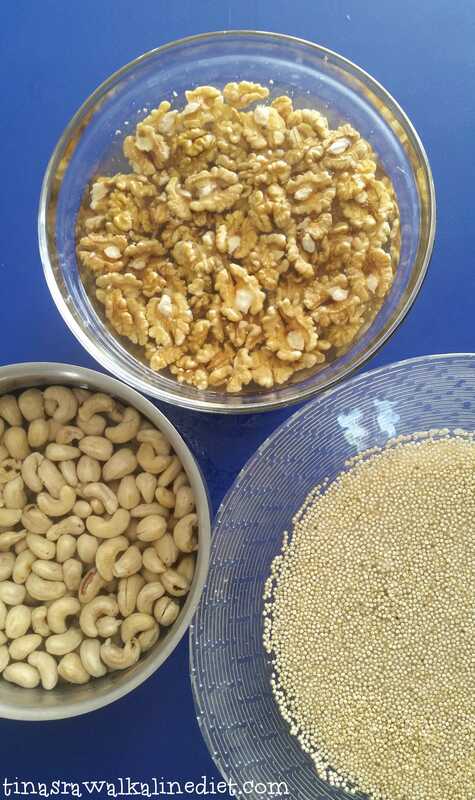 The soaked goodies can be used right away, may be for making nut milk or crackers. Drying them in the dehydrator creates a longer shelf life. Some seeds, legumes and grains like quinoa and beans are great to sprout further and make them even more nutritious and alive. 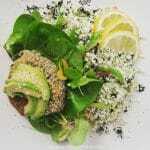 Sprouting makes everything more alkalizing and easier on the digestion. Living food is richer in easier absorbable vitamin, minerals and in a much larger amount than the non sprouted choice. Removing the phytic acid is also important when you are frequently using oatmeal. 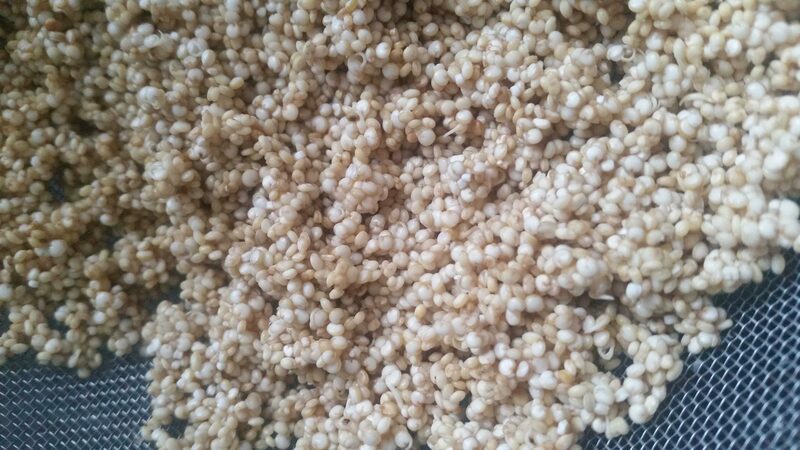 Adding a scoop of buckwheat flour to the soaking oatmeal, which is rich in phytase, helps to get rid of the unwanted phytic acid easier. Soak for about 6 to 8 hours, rinse, use or dehydrate to make a flour or some yummy granola. Sprouting quinoa is actualy quite easy and it makes this wonderful seed even more nutritious! Beacause of the fact that the seeds sprout so quickly makes it more doable and gives it less chance of going wrong. Soak for 2 hours in in clean filtered water, rinse well and shake the excess water off. I always use a sieve with small openings, I find this the easiest way to go. Love easy! Place the sieve above a bowl and cover it with a clean cloth. Repeat twice a day, rinse and shake. Depending on the temperature and humidity, the quinoa should be sprouting within a day and surely within 48 hours. Sprouted means little tails appear and the seeds are now alive. 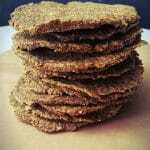 It can be eaten raw, cooked or dehydrated for flourr, for a longer shelf life or used in a cracker like I did. I add raw sprouted quinoa to my smoothies for an extra boost. You can also sprout in a jar or bag, this is just how I like to do it. 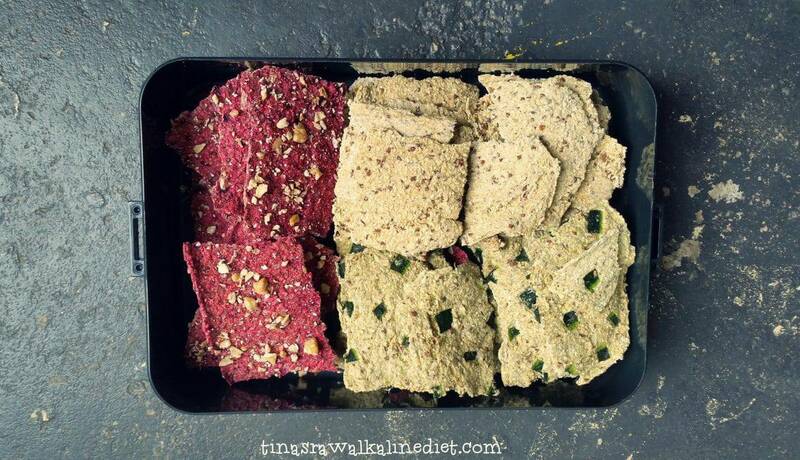 1 cup of cubed and peeled zucchini, I used the peel cut in small cubes to decorate the crackers, optional ofcourse, don’t through it away though if organic, loaded with chlorophyl! These are the ingredients for the basic crackers. These can be added to a foodprocessor fitted with the S-blade and until it forms a well incorporated dough. I divided the dough in 3 parts for the 3 flavours, you can ofcourse try make one flavour, just triple the according ingredients. For the first version, Cheese Crackers I added 1 Tbsp. nutritional yeast, 2 Tbsp. pine nuts and 1 to 2 tsp. of lemon juice. Back in the foodprocessor, in the smaller bowl and processed until the nuts ahere broken down. Taste and season if needed. Version two, Fennel Thyme Crackers are flavoured with an additional half a fennel bulb chopped in pieces, about 1/2 cup, 1 to 2 tsp. of lemon jiuce and 2 Tbsp. fresh thyme leaves. Back in the fodprocessor to incorporate all the added ingredients. 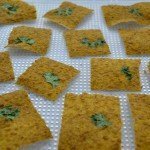 I used the small strips of the zucchini peel to decorate the crackers, makes them more interesting and funky looking. 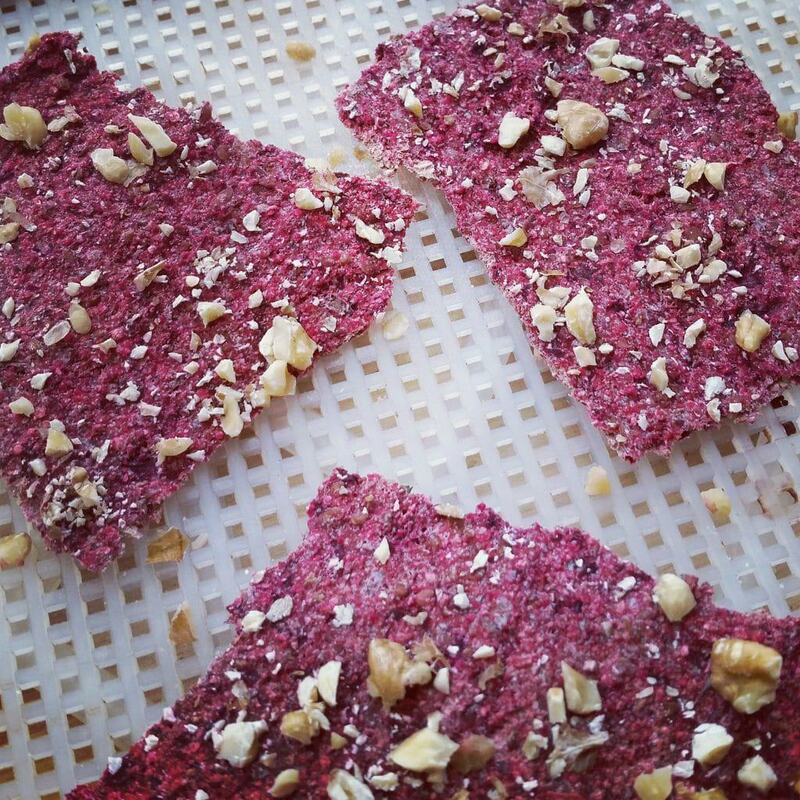 Version three, Pink Mint Crackers are coloured with 3 Tsp. cubed red beets, 1/2 cup loosley packed fresh mint leaves, 1 tsp. rice syrup or sweetener of choice, honey is a good match or a date would work also, plus 1 to 2 tsp. lemon juice. Back in the processor until fine. 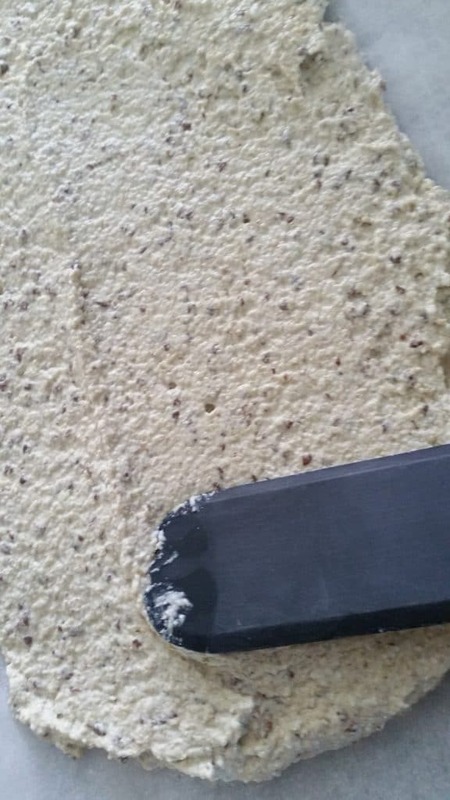 I sprinkled a few tablespoons of chopped walnuts on the dough before dehydrating. Spread the dough with a wet spatula on the bakingsheet of the dehydrator, about 1/4 inch thick and decorate for added niceness! The crackers are ready to go in the dehydrator on 105F / 40C for about 8 hours until dry enough to turn around and peel the sheet off. Dry further for about 4 hours until crunchy. I did not slice the dough but broke it in pieces once totaly dry. 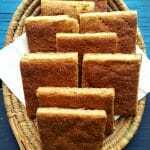 The crackers can also be scared in to desired shapes like triangles or squares. This works the best when the dough is already a little dry and not too sticky, about 5 hours into the process, depending on the thickness. Scar and dry further until ready to flip over. I guess they can also be dried or baked in a regular oven, I will be giving it a try, most crackers do work both ways. Baking makes them not raw anymore but always 100 folds better than storebought choices. They will be light and very crunchy with a mild flavour! Lovely to go with a salad, soup or to scoop up nice dips like hummus, a tomato dip or guacamole. 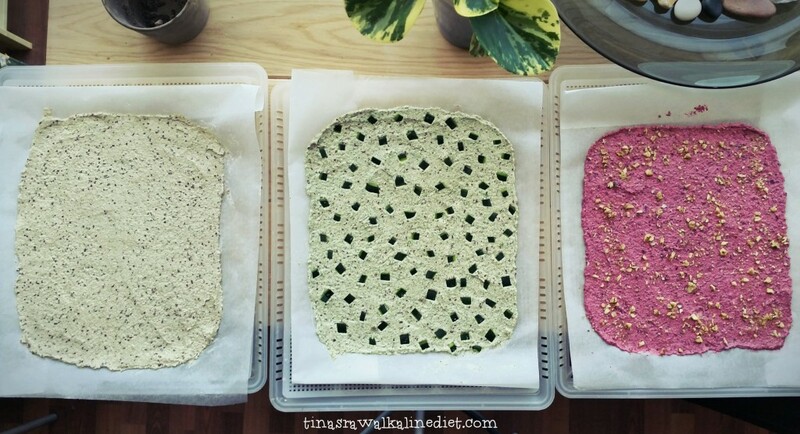 Making your own crackers can seem like a lot of fuss but it is so worth it! Making a big Making more at once saves time and energy and leaves you with a nice stash! Hallo Tina, dank voor alle super recepten. 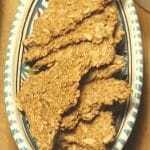 Voor dit recept heb ik een vraag: ik heb gekiemd quinoameel in de kast staan, als ik deze voor het recept wil gebruiken hoeveel moet ik dan toevoegen ipv 3 cups gekiemde quinoa?